But if you're used to teaching private piano lessons, the thought of organizing a summer camp can be a little overwh​elming. Or maybe a LOT overwhelming. What if kids don't sign up? All that hard work for nothing? Maybe I'll just wait until next year. 1. Early Bird Registration Discount! You could offer 10% off for all students who signup by a particular day. Important - make sure you work this discount into your original fee so you don't lose money. Offer $10 off for the first 5 students who sign up. You could offer more or less depending on the size of your camp. 3. First Choice of Time Slots in the Fall! Carol Ivkovich of Masterpiece - Music says this incentive works wonders in her studio! Get creative and remember to keep it fun! Want to plan a summer camp or group lessons? ​Registration is now open for Group Lessons 101. Click here to see what's included! Summer camps are a great way to generate extra income - but they take a lot of planning! Our checklist will keep you on track with everything you need to remember! Success! 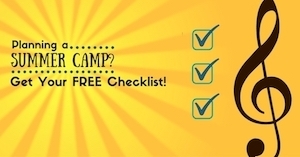 Now check your email to download your Summer Camp Checklist!